Jewish settlers began coming to Oklahoma and Indian Territory as early as 1875. The Jewish population grew as Oklahoma blossomed into a boom area, after the famous Land Run of 1889 and statehood in 1907. The early settlers came as peddlers and salesmen and later became shopkeepers and retail merchants. According to the American Jewish Year Book, there were 1,000 Jews in Oklahoma Territory in 1901. For Oklahoma's centennial, the Jewish Federation of Greater Oklahoma City highlighted the stories of Jewish Oklahomans who were pioneers to our state. Here are some of their stories. The Jews of Oklahoma came at the turn of the century and primarily became merchants or turned their scrap metal business into the pipe and supply and oil business. Later, the arrival of large chain stores and the relocation of many Jewish families to the larger cities led to the demise of the small town merchant throughout the country. For example, Miami, Oklahoma, was the home of the Price and Ander families for many years. The Louis Price & Sons' store on Main Street in Miami was established by Louis Price's grandfather with stores in Baxter Springs and Chetopa, Kansas. Anders Shoe store remains the only Jewish owned business in Miami, and Dena Ander is the only Jewish resident still living there for her entire 101 years there! Many of her customers once worked in the zinc mines in nearby Picher. The Youngheim store was a fixture in El Reno for many years. It was early in October 1901 when Herman Youngheim arrived at Ellis Island from his hometown of Bad Wildungen, Germany. He had relatives in New York City who met him and put him on a train to Oklahoma. Unable to speak or understand English, his uncle put a tag on his coat with his name and the name of his brother who was to meet him when the train arrived in Chickasha, Oklahoma. Adolph and Herman rode in a horse-drawn wagon to Anadarko, Oklahoma, where they opened a clothing store in a lean-to, which was also their home. As the years past the brothers moved the store into larger buildings and they moved into a boarding house. Herman met a young Jewish girl from Fort Cobb, Oklahoma, a small town only a few miles from Anadarko. Her name was Estelle, and she was the daughter of Dr. and Mrs. A.C. Pickens. 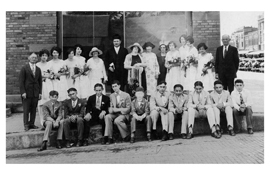 Herman and Estelle were married by Rabbi Joseph Blatt in Oklahoma City on April 25, 1914. Their first child, Aaron, was born on December 14, 1916 in Anadarko. In the fall of 1918 Herman, Estelle and Aaron moved to El Reno and bought a clothing store. Herman was responsible for bringing many Jewish families from Germany to the U.S., starting in 1929 until after the war. 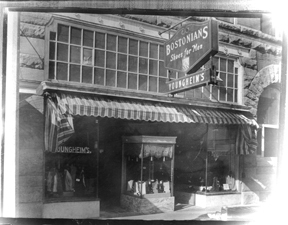 Herman always closed the store for the High Holy Days right from the beginning in 1918 when he first opened his own store. He would place an ad in the local paper telling the public that the store would be closed for the holidays. Herman was active in the Chamber of Commerce, Kiwanis Club and other local organizations. He passed away June 3, 1969, and was laid to rest with Rabbi Levenson of Temple B'nai Israel in Oklahoma City officiating at the service. Son Stanley married Ruth Mitchell after she converted to the Jewish faith. They were married by Rabbi Joseph Levenson on February 8, 1971. Stanley served one term on the Temple board. Aaron was Bar Mitzvah in 1929 at the Old Synagogue, and Stanley was Bar Mitzvah at the Synagogue in 1938. Stanley and Ruth live in the same house that Estelle and Herman had lived in since 1926, the only house that Stanley has lived in except for his time in the Army and college. After 71 years of business, Aaron and Stanley retired by selling the clothing store in El Reno. Harry Sobol, a Jewish immigrant from Russia, arrived in Oklahoma at the turn of the century. Mr. Sobol first opened a dry goods store in Fort Towson. 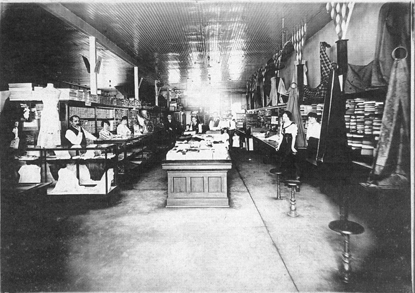 In about 1913, the Sobols opened another store in Broken Bow. One group of customers in Pushmataha County asked Mr. Sobol to go to Washington, D.C. to request that the postal authorities establish a town post office. When he succeeded, the town was named Sobol, Oklahoma, in his honor. The Jews of McAlester enjoyed their own community center for many years. 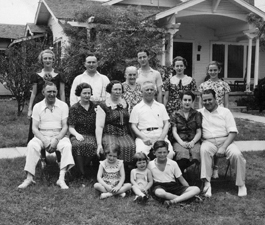 In the 1940s, the Jewish community in Southeastern Oklahoma consisted of several Jewish families, and a house was purchased for them to use as a community center. The “Community House” became the location of monthly meetings of the National Council of Jewish Women and B’nai Brith. Covered dish dinners and poker games for the men followed the meetings. High Holiday services were held there, and the Center owned a Torah. The services were led by local resident Harris Gladstein. When the number of Jewish families in the area dwindled, the center was sold and the Torah was donated to another temple.